It owns household brands such as Gardenia and Bonjour under its bakery business segments and Cowhead and Farmland under its trading and logistics business segments. It’s AGM season. Here are the on-site coverages of the top 5 AGMs that happened this week. Is Venture(V03) a hidden gem? This is written by @fayewang, stock market analyst at investingnote. One strength of SIA group is their well diversified and targeted business. After the group took 56% ownership stake of Tiger Airways and become its parent company in October 2014, SIA accomplished their strategic portfolio. Subsidiaries include Silkair, Scoot air and Tigerair, all contribute to the revenue of SIA group. The well structured business model also plays an important role in passengers yield battle amid SIA group and their competitors. Singapore Airlines, financial result 2015/2016, find the full report here. March 20, ‘SIA Cargo may make provision in current financial year due to fine’, refer to the news here. March 17, ‘SIA, 10 other airlines hit with S$1.2 billion fine by EU regulators for taking part in cargo cartel’, see the content here. March 15, ‘SIA’s load factor up 3.2 percentage points in February’, check the detail of performance here. SIA group, the flag carrier based in Singapore, maintain their steady operating performance since 2012. In 2016, their net profit doubled, which is not really a result of better operation, but mainly because of decreasing fuel price and less loss in the activities from hedging on fuel. SIA preserves a stable balance sheet. The group gained high dividend on long-term investment, thus spent additional money in investing, plus less proceeds from different disposals and share insurance, SIA held lower amount of free cash in 2016. When compared to competitors, SIA keep the most stable performance. Under the circumstance that Cathay Pacific met loss this year, SIA managed to beat Cathay by profit margin, but threat from budget airline companies are still serious. Compared to the performance in 2015, SIA observed 2.1% drop in their revenue in 2016. Revenue was decreased in all four business segments. For flight carrier like SIA, the fuel cost will occupied large portion of the total operating expenditure. Thus, the $1052.7 reduction of fuel cost in 2016 was the main reason of 4% expenditure decline in the income statement. News about the effect of lower fuel price on SIA’s net profit in the financial year of 2016: ‘SIA profits soar on lower fuel prices, one-off gains’, refer to the news here. However, it turned out that the significant progress in net profit is not really a result of improved operation. How did GSS Energy(41F) achieve a YTD yield of 122.35% in 3 months? Photo source: GSS Energy is moving into energy trading, after starting a joint venture with oil trading company AFCO Energy. 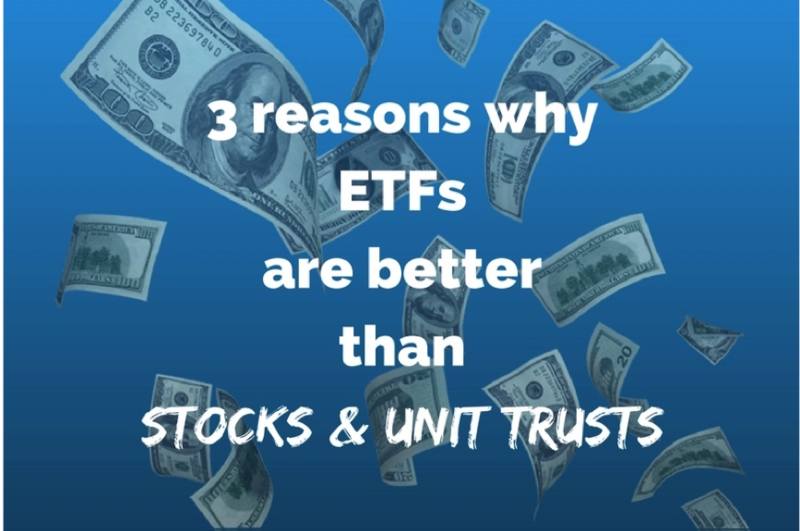 3 reasons why ETFs are better than unit trusts and stocks. When it comes to topic of investments, the common asset types often talked about are stocks, unit trusts (synonymous with mutual funds) and exchange-traded funds (ETFs). What are the key differences and similarities? Moreover, as a new investor, which one should you look at?